Easy Systems and Taggit SA have developed an easy-to-use, client-branded and customisable web and mobile application to manage visitors to companies, business parks and estates. By now, we have all spent time filling in our details in those books passed through our vehicle windows, trying to fit our details into a space that is never big enough. It just doesn’t make sense. And while there are some scan-in systems available in this space, the Gate Manager solution has been developed to allow for easy operation by the guards, providing accurate and timely information for the clients and at an attractive price point. • Ideal for single-occupant site, multi-occupant site or residential estates. • Configure multiple-contact persons per business. • Configure regular visitors authorisation for immediate access. • Customisable guard checklists to confirm the correct procedures are being followed. 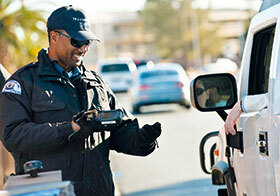 • Driver’s licence and vehicle licence scanning capability. • Visitor information captured on screen. • On-screen display of terms and conditions of entry with on-screen signature of acceptance. • Configure SMS alerts to hosts on arrival. • Custom reports of visitors and duration on site. • Accurate data of who is on site at all times. • Includes an IP68 all weather smartphone device with 13 MP camera, Wi-Fi and 3G connectivity. For more information, contact Taggit SA, +27 (0)31 560 0101, craig@taggitsa.co.za.